This article will show you how NetBlaze can help you increase your customer rating by getting more reviews from your customers. NetBlaze was designed to help small businesses get more customers. Everyday, customers go online to look for recommendations vs. looking at the phone book. Its important that you monitor daily what your customers are saying about their experience with your business. NetBlaze can help you maintain your good review rating or improve your low/average rating by sending review requests to your existing and new customers. A review request is a message that Netblaze sends to your customers asking them how their experience was with your business. Whether the experience was good or bad, you want to get their feedback. You can always control what reviews you want seen by others. Netblaze review requests are sent by email or text message. Here's how to set this up in your NetBlaze account. First thing you need to do is to make sure that sending Review Requests is enabled. Click on the gear icon on the top menu and then click on Customers. 2. You should see the Customers Settings. The first field is a dropdown called "Send Review Requests after adding Customer?". Select "Yes". Email Primary - Select Email Primary if most of your customers provide you their email address. This means that Netblaze will prioritize sending the review requests via email. However, if the customer does not have an email address, Netblaze will try to send the request via Text. Text Primary - Select Text Primary if most of your customers provide you their phone number. If selected, Netblaze will prioritize sending of the review requests via Text. However, if the customer does not have a phone number, Netblaze will try to send the request via Email. Email Only - Select Email Only if ALL of your customers provide you their email address. If selected, Netblaze will always try to send the review request via email. If there's no email address in the contact, review request will not be sent. 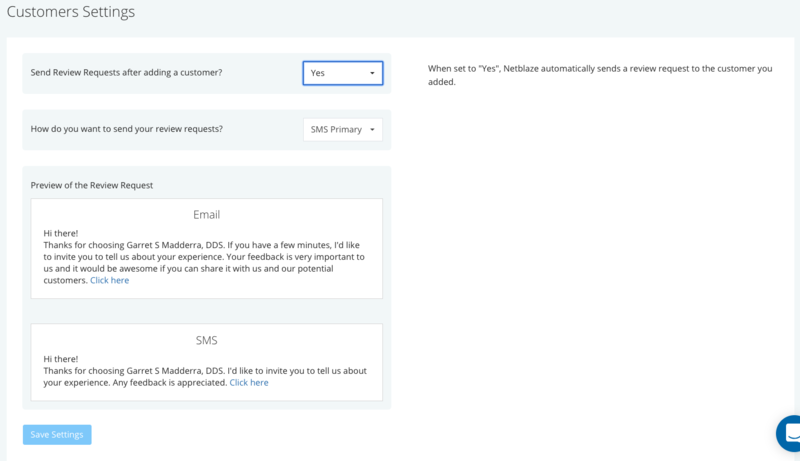 Text Only - Select Text Only if ALL of your customers provide you their phone number. If selected, Netblaze will always try to send the review request via Text. If there's no phone number in the contact, review request will not be sent. Email & Text - Select Email and Text if ALL your contacts contain email address and phone number. If selected, Netblaze will only send the review request to a contact that contains both email address and phone number. 4. Once you have selected how you want to send the message, take some time to look at the Preview of the Review Request. At this point, the messages are not customizable. 5. When ready click Save Settings. 6. Now that sending review requests is enabled, start adding your customers contacts to NetBlaze. You can read this guide on how to add your customers no NetBlaze.